A waffle-like texture and a beautiful spectrum of pinks, peaches, and russets, our Tonal Blanket is truly a stunning knit. 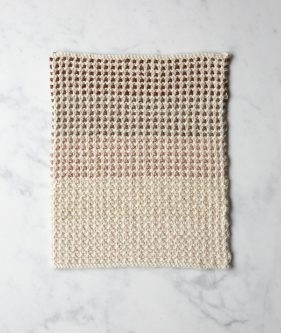 And as it turns out, all this beauty is only as challenging as a simple slip stitch, which means beginners can learn something new and make something gorgeous without being in over your head! 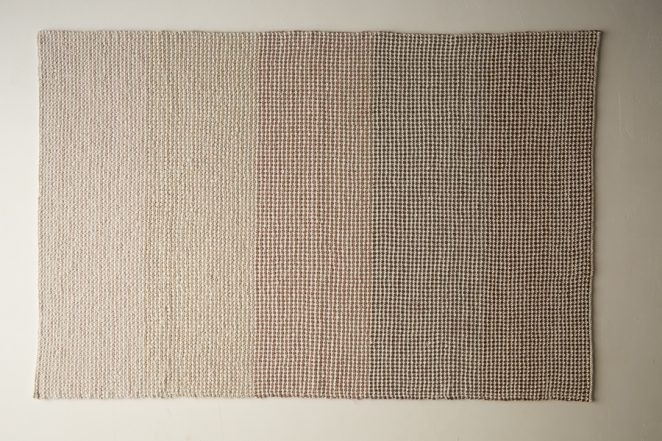 Taking a closer look, you can see how the wide stripes of heather-ed tones sharpen into a complex texture, where distinct pops of color seem to peep through tiny Heirloom White panes. 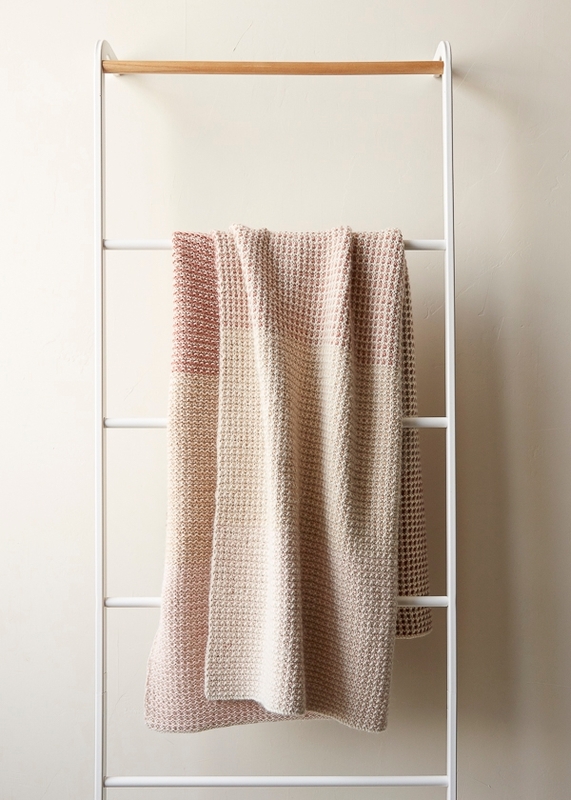 And in our Season Alpaca, the finished Tonal Blanket has a gentle heft and a wonderful warmth that’s just right for when the mercury drops. 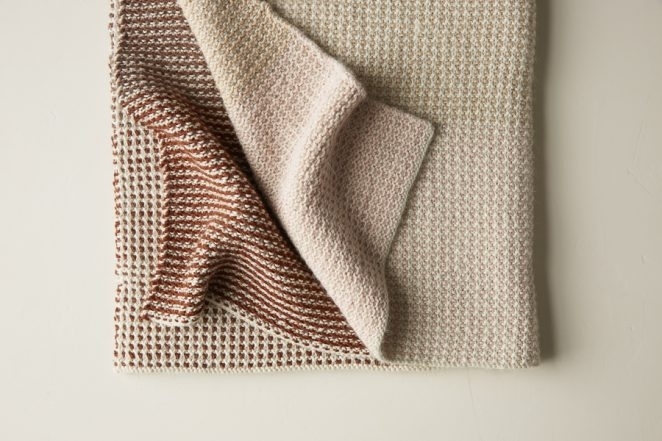 Get started with our Tonal Blanket Bundle, which includes the yarn you’ll need to make a Crib size blanket (add 5 more skeins of Heirloom White for a Throw size). 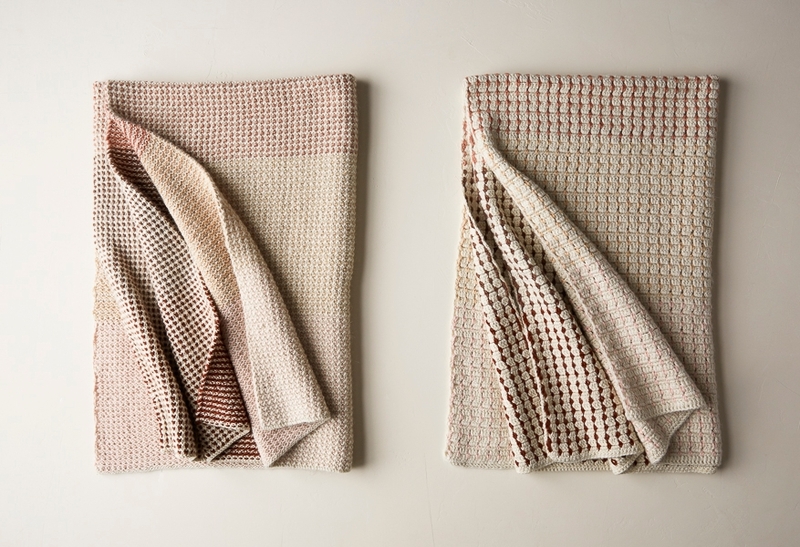 Choose between this toasty Warm spectrum or our Cool version, which ranges from soft lavender to dark ocean blue. Either way, this is a blanket to treasure! This project designed for Purl Soho by Jake Canton. Crocheters can get in on the action, too! Our Crochet Tonal Blanket version is made up of just single and double crochets that form a tiny checked pattern. The learning curve is the opposite of steep, and before you can say “ombré,” you’ll have a gorgeous spectrum of color coming off your hook! When changing colors, carry the new yarn up the selvedge in back of the old yarn. With Main Color (MC), cast on 181 (273) stitches. Row 1 (right side): With MC, knit to end of row. Row 2 (wrong side): Repeat Row 1. Row 3: With Color A, *k1, slip 1 with yarn in back, repeat from * to last stitch, k1. Row 4: With Color A, *k1, slip 1 with yarn in front, repeat from * to last stitch, k1. Repeat Rows 1-4 until piece measures 8 (10¾) inches from cast-on edge, ending with Row 4. Now with MC and Color B, repeat Rows 1-4 until piece measures 8 (10¾) inches from where you cut Color A, ending with Row 4. With MC and Color C, repeat Rows 1-4 until piece measures 8 (10¾) inches from where you cut Color B, ending with Row 4. With MC and Color D, repeat Rows 1-4 until piece measures 8 (10¾) inches from where you cut Color C, ending with Row 4. With MC and Color E, repeat Rows 1-4 until piece measures 8 (10¾) inches from where you cut Color D, ending with Row 4. With MC, repeat Row 1. Bind off (wrong side): With MC, bind off knitwise. Weave in ends, and block if desired, but we didn’t! 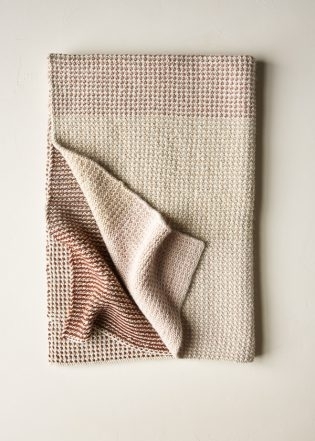 Have a request for the Tonal Blanket in the warm colors and want to buy during this sale period. 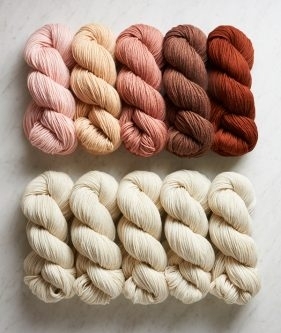 Found your color recommendations for Cotton Pure — Icy Pink, Teacake Pink, Pink Sand, Rose Bark, Sea Pink, and Egret White (MC). Gorgeous!But when I tried to order, saw there was no Rose Bark. 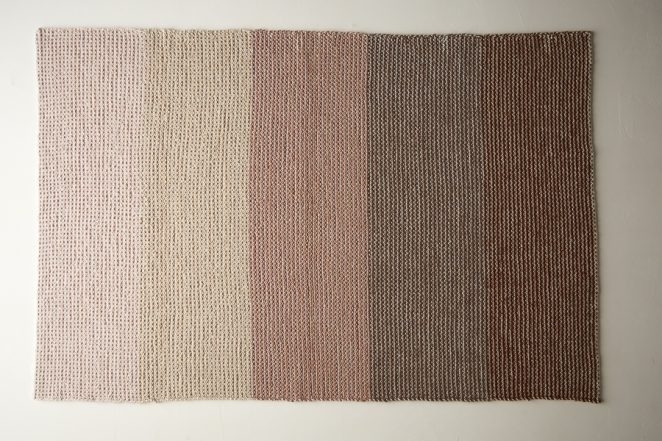 Can you recommend a different warm color progression in Cotton Pure? Thanks for reaching out! I think either Pale Almond or Purple Heath would work quite well with the palette you have picked out, depending whether you want to shift things a bit towards either the lighter or darker end of the spectrum. 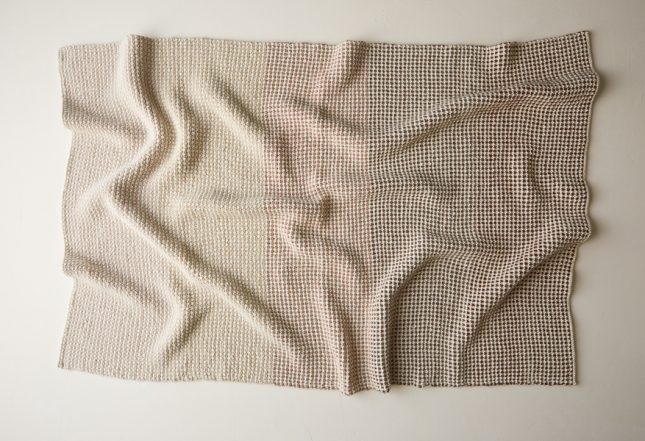 Would this pattern look good making it in a solid color? If so, would you just use 15 skeins of a solid to make the throw size and ignore the color changes? Great question! 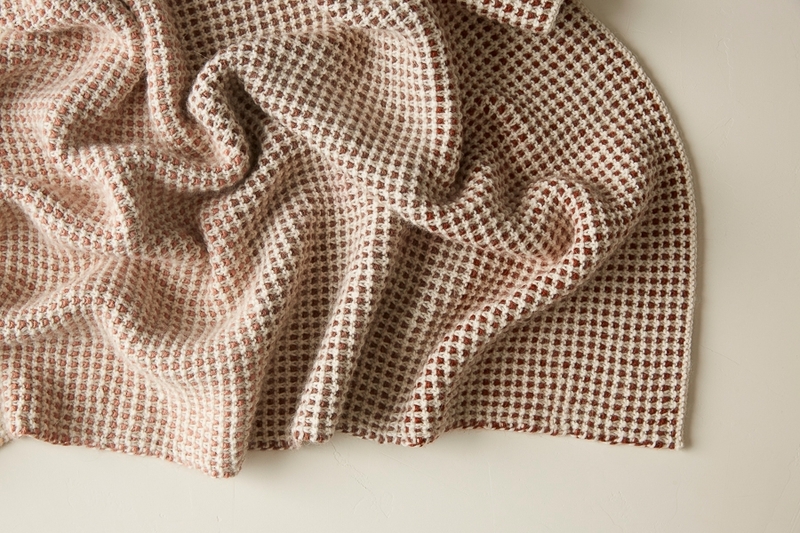 Yes, without the contrast color, this throw still has a lovely, squishy waffle-like texture that is quite pleasing! Since we did not use all of each skein of the contrast colors, you would need 13 skeins. Happy knitting, and please let us know how it turns out! Can I use your worsted cotton for this blanket? 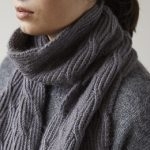 If so, how many skeins are needed and what colors would you suggest for a baby blanket in blues and or greys? I would have tried the pure cotton but you don’t have the colors you suggested. Thank you for reaching out! 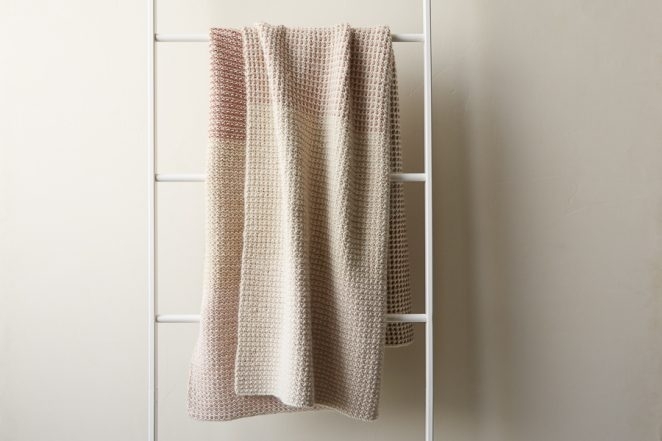 You certainly can use Blue Sky’s Worsted Cotton for this blanket, but Because it is a thicker yarn you will need to go up in needle size and down in your cast on (depending on what size you would like your blanket to be). 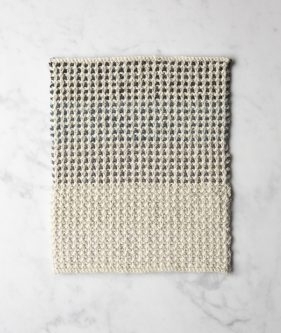 I would reccomend knitting up a gauge swatch with a size 8 needle to see if you are happy with the gage before jumping into your project. 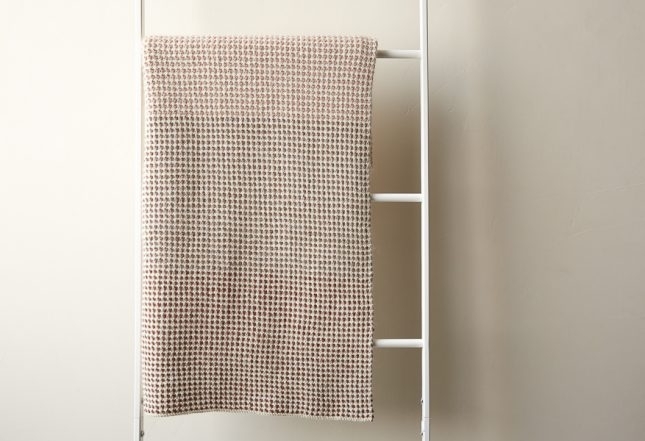 You could certainly knit up this blanket with our Cotton Pure without any adjustments needed, though we don’t have a Light Blue in Cotton Pure. If you go with the Worsted Cotton I think that the colors Lavender, Sky, Ash, Periwinkle and indigo would be a beautiful combination. I’m not sure exactly how many skeins it will take knit with a US 8, but you might need a couple more base color skeins to get your blanket large enough. 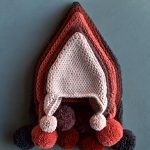 I hope this gives you some ideas and happy knitting! I appreciate your help. I am using the colors you suggested with drift as the main color. I’m hoping the drift will look nice. It’s hard to pick colors on line. I’m making a crib size. I’m using size 8 needles and casted on 91 stitches.